Meet Jean! Jean found FIT4MOM through a Google search and after taking the leap to try a Body Back class, she knew it was just what she needed! Since then, she has completely transformed her lifestyle and her body through multiple Body Back sessions. She is a wonderful example of health and strength to other mamas but also to her kiddos who join her in our Stroller classes as well. We are so glad you found our community of like-minded mamas, Jean! Tell Us about your family: Kevin (who was a friend of a friend) snuck me into Lollapalooza in 2009. We started dating shortly after and have been together ever since. We have been married for 4 years. 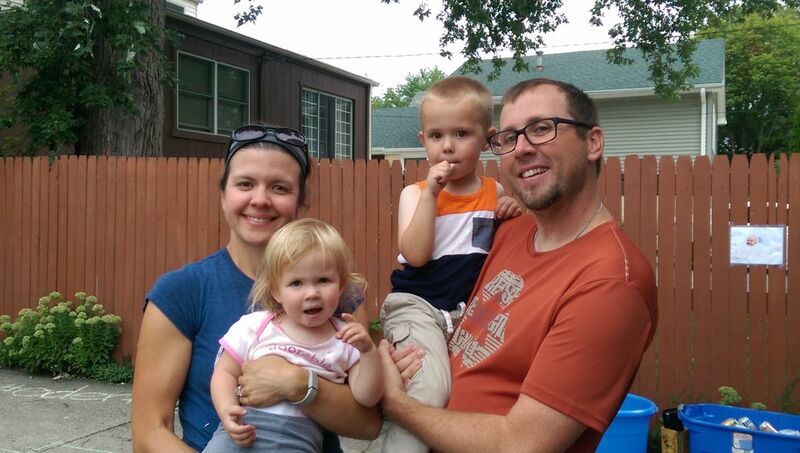 We have a 3 year old son Walter and 22 month old daughter Mabel and live in Lombard. Current/Previous Career: I have an accounting degree from the University of Illinois (I-L-L……). I worked in public accounting for 2 years at Deloitte and then 7 years at McDonald’s in the corporate accounting department. Although, I was “loving it” at McDonald’s, the hours were very long. So I ditched the office to be a stay at home mom for 2+ years. I think finding a part time accounting gig when the kids get older would be ideal. Childhood ambition: I wanted to be a high school math teacher until I got to college and got scared away by how many calculus classes you had to take. What does motherhood mean to you? Changing diapers and translating children’s wining. It also means being the best possible version of yourself every day, because the kids are always watching you! I want them to be happy and healthy, but sometimes am second guessing myself if I am doing things right. It is so fun to see them develop new skills and expand their vocabularies. When our kids develop new habits and tendencies (both good and bad) my husband and I have fun determining which side of the family they got that from. Furthest you have been from home: Spain. After college, a friend and I visited Madrid, San Sabastian, Menorca, Barcelona and Granada. I loved the food, architecture, sangria, oceans and mountains. How did you find FIT4MOM: I found out about FIT4MOM from my good friend Google, and then became more interested after seeing some Facebook activity. How has FIT4MOM changed your life: Before finding FIT4MOM I was pretty down on myself, because my weight was at an all-time high. After having 2 kids and being over 30, I was having hard time losing weight on my own. After my free trial Body Back class, I knew the intense workouts and clean eating meal plan was exactly what I was looking for to get back in shape. I signed up for a full session Body Back and loved the challenging work outs and meeting other fun, local, supportive moms who share an interest in being active and healthy. Also, the programs really work and it was motivating to see actual results! I also do Stroller strides/Stroller barre and it is great to get a work out in with the kids. Wally regularly sings the stroller strides songs outside of class, and Mabel is starting to sing them too. In short, FIT4MOM has helped me feel like my old self and taught me how to have an active healthy lifestyle with kids. Favorite Exercise: Bicycling! I love riding outside on the Prairie Path or Great Western Trail. For me riding outside is my time to clear my head and get a good work out in. I also love playing softball and broomball. Proudest Moment: My first day of watching both Wally and Mabel solo, when my husband went back to work. Wally was 18 months and Mabel was about 2 weeks old. I took it hour by hour trying to get Wally’s snacks and play time in between nursing sessions with Mabel. I don’t think we even left the house, but after surviving my first day, I became more confident that I could handle 2 kids under 2! Tell us something about yourself that would surprise us: Some of you know I have an identical twin. She lives in Naperville and is expecting her 1st baby in November. Something else, when I was 1 month pregnant with Wally, my husband and I won a badminton tournament. When I was 1 month pregnant with Mabel, my team and I won a broomball league championship. I guess the early on pregnancy hormones give me an extra competitive edge.